A man-machine interface is disclosed for translating discrete hand positions into electrical signals representing alpha-numeric characters. 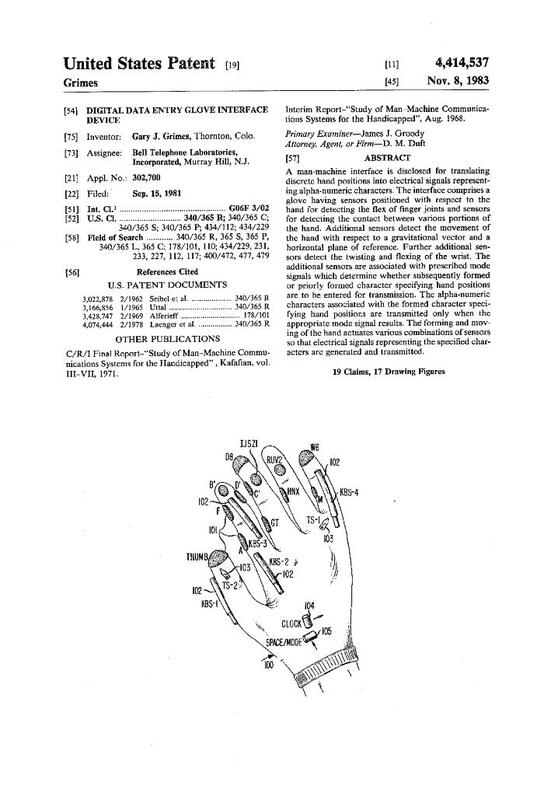 The interface comprises a glove having sensors positioned with respect to the hand for detecting the flex of finger joints and sensors for detecting the contact between various portions of the hand. Additional sensors detect the movement of the hand with respect to a gravitational vector and a horizontal plane of reference. Further additional sensors detect the twisting and flexing of the wrist. The additional sensors are associated with prescribed mode signals which determine whether subsequently formed or priorly formed character specifying hand positions are to be entered for transmission. The alpha-numeric characters associated with the formed character specifying hand positions are transmitted only when the appropriate mode signal results. The forming and moving of the hand actuates various combinations of sensors so that electrical signals representing the specified characters are generated and transmitted. Note that the glove detects the hand gestures of the American Manual Alphabet only, not American Sign Language (ASL). Originally filed on Sept 15, 1981.